bulk material processing and handling systems, is seeking new relationships with construction equipment dealers and distributors at bauma 2019. Before the event, distribution representatives looking to meet with Superior at bauma are asked to complete an online form at www.superior-ind.com/bauma-2019. sign standards and unique features for the European market. First established in 1972, Superior was founded by the son of a sand and gravel producer. At the beginning of his career, Neil Schmidgall improved portability and production technology for his father’s plants. When neighboring aggregate producers asked if he could improve their equipment, Schmidgall took his company public. Since then, Superior has maintained a strong entrepreneurial and enthusiastic approach to business. The manufacturer established conveyor and plant portability designs that are favored all around the world. 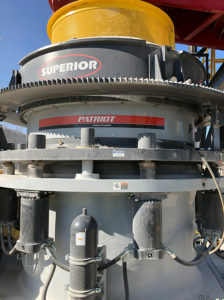 In 2016-17 – after several acquisitions and some in-house design projects – Superior debuted a brand new group of crushing, screening and washing equipment. These products joined an existing and evolving conveyor and custom plant portfolio for a complete product offering from Rock Face to Load Out®. In addition, Superior uses its material handling skills to design and build a dependable line of conveyor idlers, pulleys, scrapers and accessories. The rapidly growing, locally-owned company is headquartered in Morris, Minnesota, with ten additional manufacturing plants throughout the United States, Canada and Brazil.